Tired! Tell me if I am wrong, but day 3 of a cycle tour always seems to be the hardest day of a ride. I made it out of Penneshaw at a good time, by which I mean the civilised time of 9:30am, and I was immediately confronted by Penneshaw Hill. According to everyone in town it is the biggest hill on the island, and judging by the fact I entered granny gear just looking at the hill I hope it is true. Despite this, and a bike loaded with 5-8days of food, I only took breaks to adjust my seat and was happy to find that my bike was well loaded for the trip. I also realised as I pedalled up the hill that most of my knee problems so far on the ride were to do with pedalling technique. For anyone new to cycle touring the most important thing to remember about pedalling is o put no force through your knees, just spin the pedals and let the bike do the work. 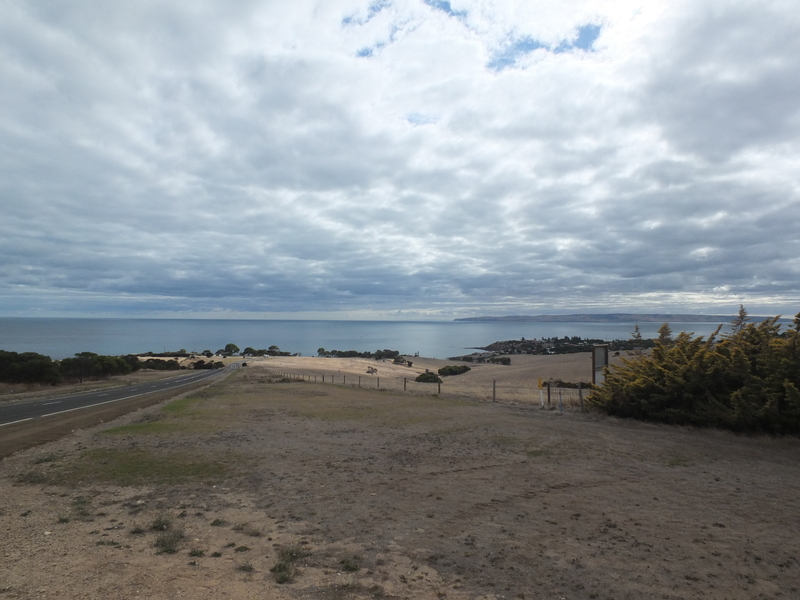 Anyway, issues resolved I made good time to Prospect Hill, where Matthew Flinders climbed up high and surveyed the waters north of Kangaroo Island. Before I embarked on the steep climb I enjoyed a pleasant lunch break (sans picnic table) being ignored by tourists and backpackers alike. 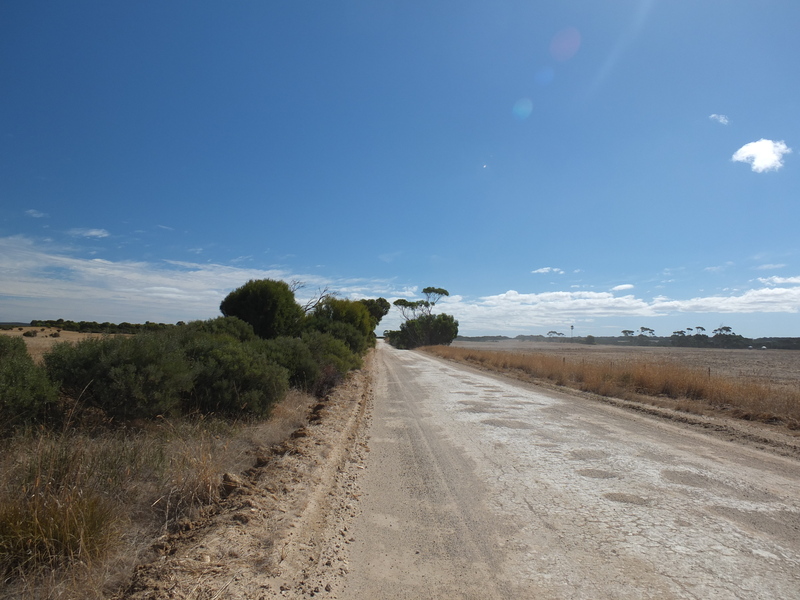 From here on the going gets tougher as I entered the realm of the Three Chain Road, a 30km section of unsealed road that would take allow me to save 30-40km at the cost of limestone, sand and iron pea gravel. To my advantage the road had been graded recently so there were few corrugations, but the loose top soil had collected in every little depression resulting in lots of foot work to keep the bike vertical. I’d go so far as to say that most of tomorrows sore leg complaints will be from catching the weight of a 60kg bike and not from cycling itself. 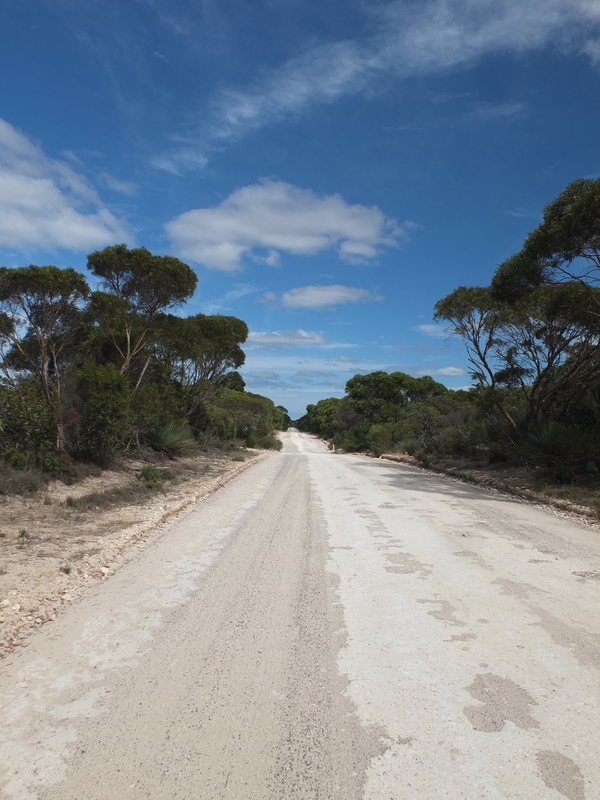 Three Chains Road, some sections were like this, other sections were red pea gravel of deep sand. Along the side of the road there were a few of the amazing salt lakes that are scattered across KI despite its coastal location. 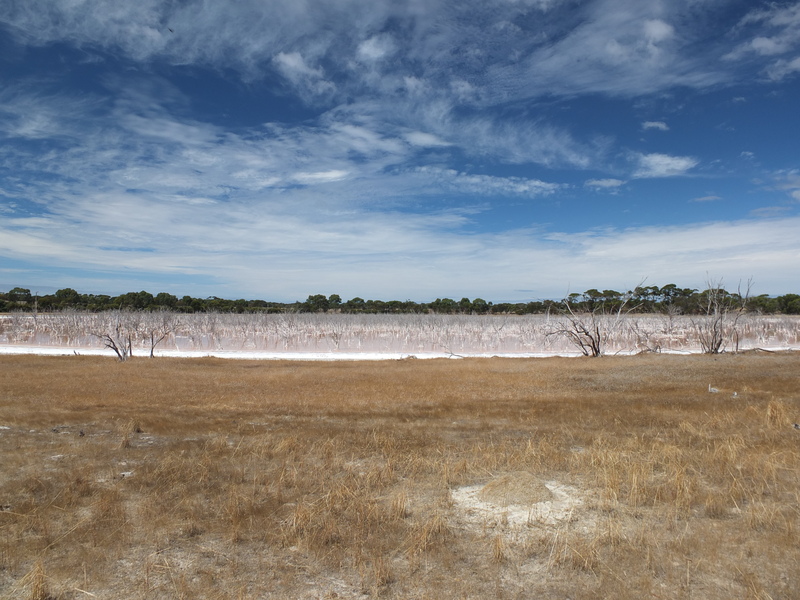 Kangaroo Island is spotted with salt lakes despite the coastal location. I’d love to know how they form. 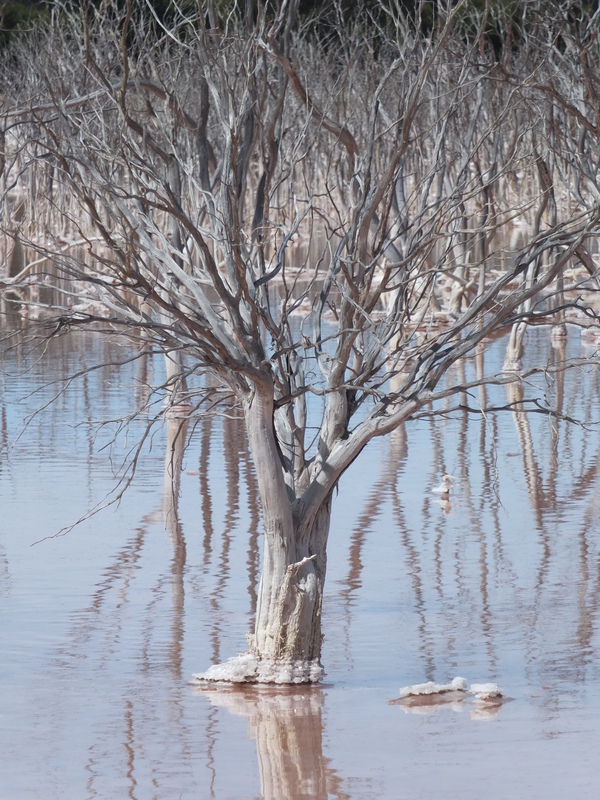 A tree encrusted with salt. Anyway the day ended up being very pleasant in reality, and I would recommend the Three Chain Road to any cycle tourists going to KI. Just check on the quality of the road with the locals before headings into this area. The day ended with a coffee and fruit cake at the Murray Lagoon which is a nice enough campsite, though really it is probably just a glorified campsite. “Just spin the peddels” sounds good in theory, but what if you’re out of gears climbing an especially steep hill? Or do you have a special touring bike with extra low gears? I have a touring bike with solidly low gearing. That said it is often still wortg remembering that pedaling is easier than pushing.